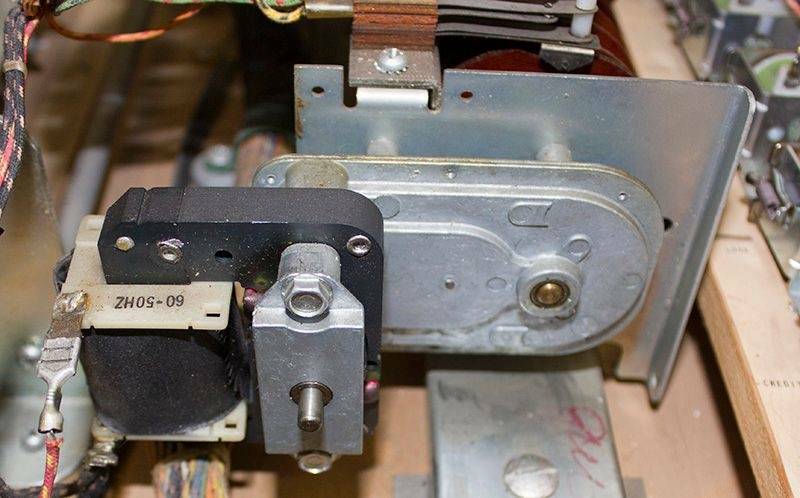 When the game is started for the first time after sitting overnight or a few days, the score motor turns over slowly. It is easy to see because the score reels reset slowly. After the first time, it then picks up to a good speed from then on as you use it. It is in the garage so it does get some temperature variation, but not much. But we did have a cold streak for a few days (I think it got into the 50s), and it does seem like it is worse when it is colder. Interestingly, I have a Bally Monte Carlo right next to it, which is very similar and has the same score motor, and that thing always fires up like a rocket even after sitting overnight in the same "cold". So my question is should I worry about it, and/or what could I do about it. Here is an end view of the motor and what I presume is a gear box. There don't appear to be any lubrication points and I know in general that lubing things is to be avoided, although not always. I am not too thrilled with the idea of disassembling it to clean it, but if I have to do it, I will. Just afraid I will botch the job and kill it, and that would be bad. I write - but it is not a "real help". I like this document: http://rwatts.cdyn.com/download/intro%20to%20bally%20flipper%20games.pdf They say a couple of things about Lubrication - they say a couple of things about "Score-Motor". I have looked in http://www.pinrepair.com/em/index.htm -> http://www.pinrepair.com/em/index1.htm#lube and -> http://www.pinrepair.com/em/index3.htm#motor - scroll down 6 to 10 pictures and text -> "Lubricating a Score-Motor" -> some words on lubing-GOTTLIEBs (not on Williams / Bally). Scroll down further -> Starting with "Fixing a burnt Motor" -> good information. Sorry for "not really helping" - but the document (first link) is good. Also (Williams) -> http://rwatts.cdyn.com/Machines/download_area.html -> Scroll down (below the middle, text "Be sure to check the Links page for additional ressources" -> the fifth link: http://rwatts.cdyn.com/download/wmseman.pdf , good information. if it starts out slow, it is prob due to the grease clotting and binding. there are other factors also, but from what you describe, it sounds like typical old thick grease. you can remove the gear box, and drill out the welds to open the box. it shud contain 3 gears, not rocket science, but can be done. a good cleaning, and a little super lube, and shud be good to go. also, chk for grease leaking around shaft, indicates it has not been feelin too great. a few small bolts and nuts, and back together again. You can also check the voltage of that scoremotor, it should be arround 50 volts. 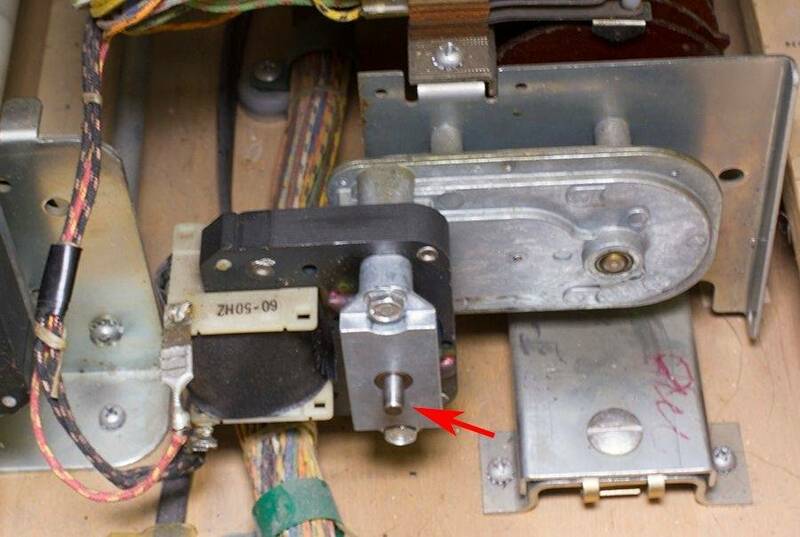 The drive shaft is spring loaded and in the rest position it is sticking out as shown by the red arrow. When the motor runs, it is pulled in and then it turns. You can press on this with your finger and push it in against the spring. When I did this, I noticed a bit of resistances, and it popped back slowly. In contrast, on the other machine it was nice and free and popped back immediately. 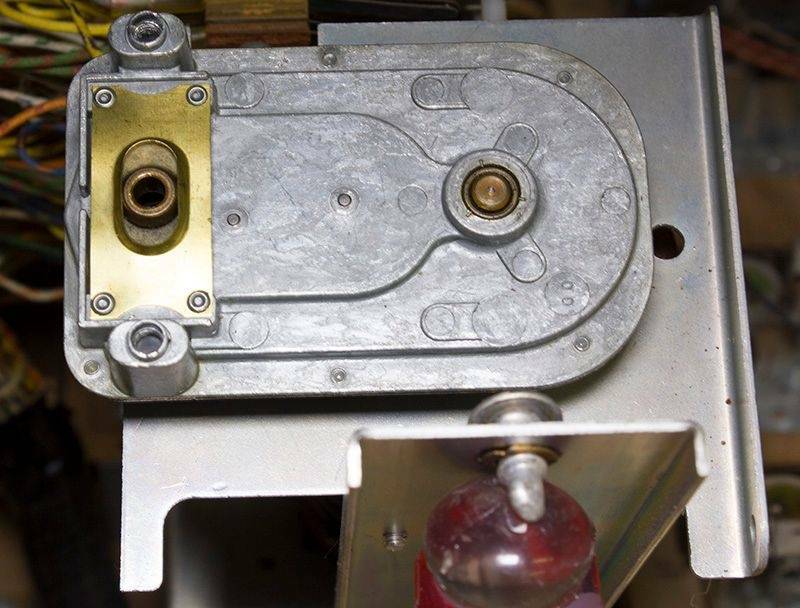 Its easy to loosen the hold down screw and raise up the hinged assembly for access. Then it is just 2 screws and the motor and shaft come right off. That leaves behind the gearbox, and the hole on the left is where the shaft fits. The shaft has a gear on the end. 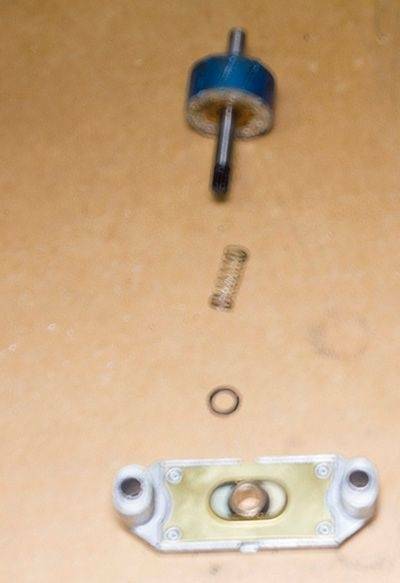 Luckily, it looks like everything is good with the insides of this gearbox, because Dr_of_Style said it is sealed and would have to be drilled to get it open. Here are the pieces for the bracket, rotor and shaft. Unfortunately I missed focus but you get the idea. It is pretty simple. I cleaned everything with alcohol and then put the thinnest possible amount of Super Lube on the shaft. After putting everything back together, the finger test showed that now the shaft was moving freely against the spring. I waited overnight and tried a cold start - and it was back to full speed. Problem solved. That's great news. 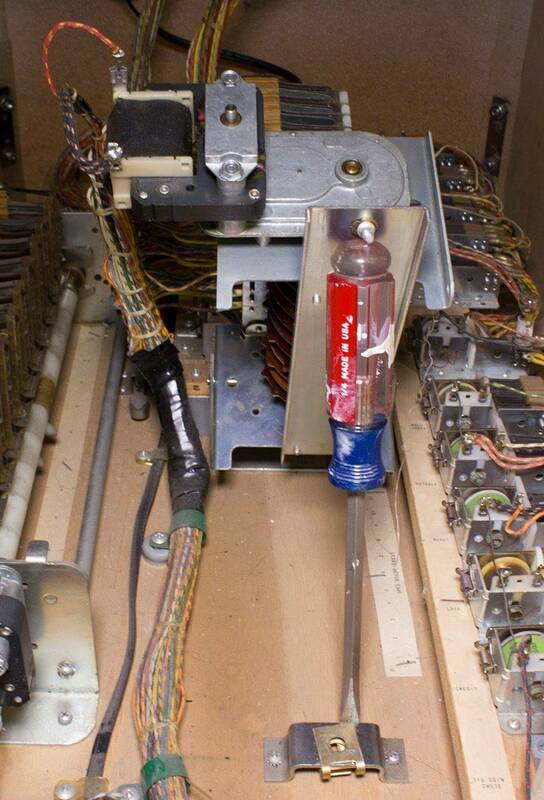 Probably any Bally of that vintage with that score motor could benefit from this pretty easy bit of maintenance. It is so much nicer to see those score reels fly when the game is started. As a side note, just out of curiosity, I was doing some reading about electric motors, specifically "AC induction motors" which I believe this is. I was wondering why that shaft "pulls in" while the motor is running, then pops back out via that spring. There must be some reason it was made that way, maybe related to the startup torque or something. Maybe someone who knows will read this. Very nicely illustrated! Thanks, xsvtoys! To try and answer your question above, as you mentioned, the blue drive-gear shaft with the threads will need to "drop out" to help the motor stop immediately. If this drive gear actually stuck in the drive position inside the motor, it would drift to a stop, and all the motor switches might not be in their normally functioning position. There's probably another braking device on this motor set-up, but it's not strong enough to stop the motor cams where they need to be. Another symptom as a result of the problem you've found would have the motor drifting to a stop, but begin another revolution again as the run switch accidently makes from the motor cam drifting too far. The symptom you would notice then, is that the motor never stops turning. I've seen this a few times on Gottlieb Games, (although the motor set-up looks quite a bit different, underneath, you'll find the same type of drive gear used). Thanks xsvtoys! Saved me some issues down the road on my Bally Amigo project... just going thru the score motor & that shaft was gummed up big time. Great news, it always fun to see another problem resolved.